The Sinusoidal Siemens Star target is consistent with the ISO12233:2014 standard. It is printed on matte paper. The modulation of the radial sinusoidal patern is close to a 50:1 contrast ratio. 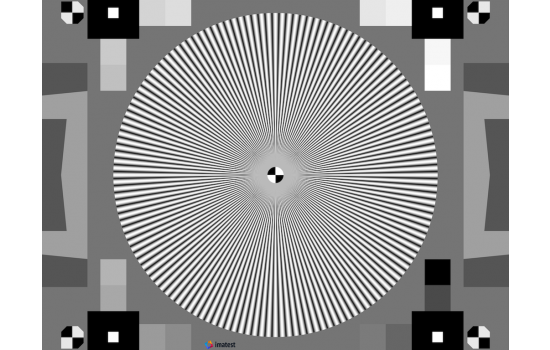 Target allows multiple samples of MTF measurements to be taken from any point within the circumference of the circle. 1x 250 mm × 333.33 mm 9.84" × 13.11"
1.5x 375 mm × 500 mm 14.76" × 19.66"
2x 500 mm × 666.67 mm 19.69" × 26.22"
3x 750 mm × 1000 mm 29.53" × 39.34"
Please contact charts@imatest.com for customizations such as sizing, tiling or for other substrates including high precision film or photographic paper.